Walt Curtis: [voice-over narration] Working in the store Sunday all day, I want to drink this Mexican boy Johnny Alonzo from L.A. near Riverside. He makes my heart throb - thumpety, bum, bum, bum, bum, bum - when I see him. 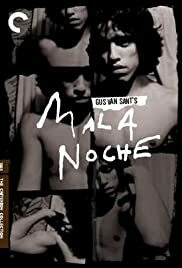 Mala Noche is kind of "a month in the life of" Walt, played by Tim Streeter, who is fawning over Johnny, (Doug Cooeyate) a Mexican who hangs around Walt's store. It's touching, sad, and frustrating to watch as Walt keeps throwing himself at Johnny, and is constantly rebuffed. Walt, who is the caregiver to just about everyone he meets, spouts life philosophy and seems to enjoy the thrill of the chase in the gritty side of town. At the same time, it's refreshing to see a film from 20 years ago treat gay characters and relationships with respect, and to give them "normal" lines without resorting to stereotypes. Oddly, Ray Monge, who plays Roberto, a friend of Johnny, is the only one has has had more than one or two roles listed in their career, and he has just four roles listed. Some neat little touches, like the bottle on a string that pulls the door closed like a spring, Walt greeting everyone on the street, and the driving lesson gone wrong. Interesting interview with van Sant on the DVD from janus/Criterion, where he explains how it was made from Curtis' story. A little offbeat and rough, but fun to watch.